I am officially no longer employed and will dedicate the next couple of months to training, which is exciting in and of itself. 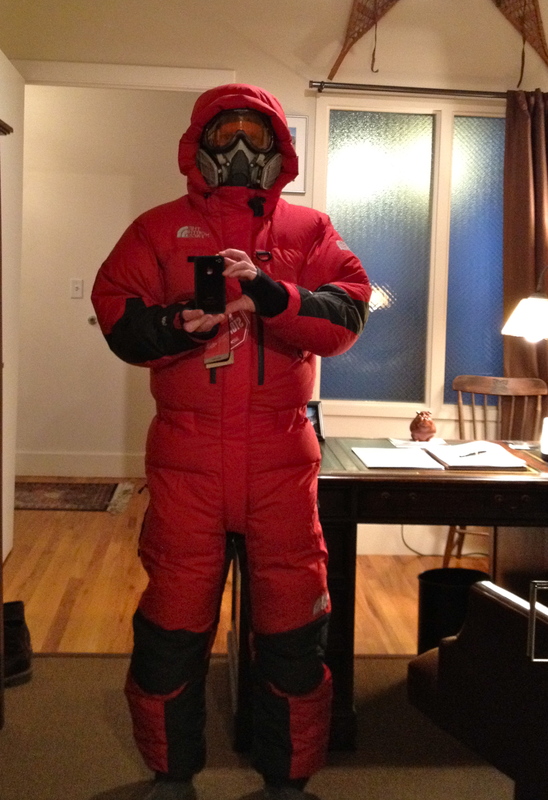 To top things off and to mark the occasion (in addition to a great Wilco show this past Thursday night in Denver), my North Face down suit just arrived to serve as a reminder that departure for Kathmandu is imminent! I tried it on, along with some goggles and the 3M mask that is the same design as the oxygen regulators that we’ll use high on Everest, so apparently this is what I’ll look like for much of summit day. Pretty crazy. As training continues to ramp, I’ve started running the stairs at Red Rocks with my buddy Ben, who will be going to base camp and climbing Lobuche with us before having to return home, as well as heading into the CO hills along with lots of interval training intermixed here in Denver (starting to do two-a-day work-outs now). Not having to worry about Monday-Friday work responsibilities will help a lot with getting the legs and lungs in top condition prior to departure. The next excursion will be a winter attempt of Longs Peak in Rocky Mountain National Park next weekend (1/27-29) with Craig and Dave (and possibly Bob) who are all attempting Everest as well this spring. That should be a good outing. I’ll let you know how it goes.